Chicago Mayor Rahm Emanuel delivered his 2017 budget address Tuesday, hours after avoiding yet another major teachers strike in the city. “It is a budget free of an immediate pension crisis, free of the black cloud of insolvency threatening the retirements of city employees and the financial future of Chicago," he said. Less than 12 hours before he took the podium, Emanuel faced down-to-the-wire negotiations with the Chicago Teachers Union, which ended with a tentative agreement just as the midnight deadline approached. The potential contract agreement meant Emanuel avoided having yet another citywide teachers strike during his time as mayor. Part of the agreement involves additional revenue in TIF money. CPS had originally offered $32 million but now the mayor's office confirms $175 million will be set aside with $88 million of it going to Chicago Public Schools. In 2011, the city faced a $635 million annual deficit, Emanuel said, a deficit that has since been cut by 80 percent, bringing it to the lowest level in nearly a decade. This year’s speech touched heavily on not just the progress made with teachers but also the city’s ongoing violence troubles. With Chicago's soaring number of shootings and homicides making national headlines, the financially-strapped city is facing a so-called violence crisis. As part of his plan to combat that violence, Emanuel touched on an earlier announcement by Chicago Police Supt. Eddie Johnson, revealing the largest hiring effort in the city's police department in years. 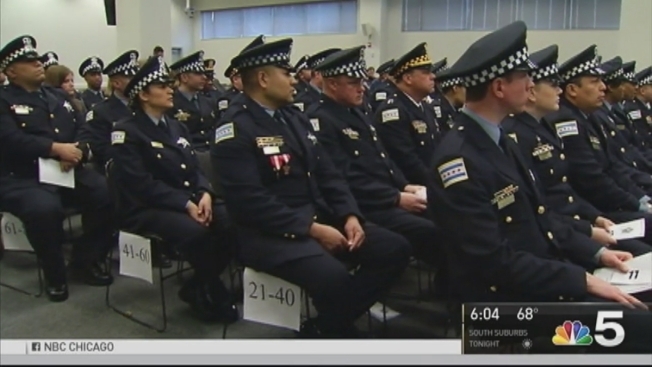 In that plan, which is expected to cost the city up to $50 million, the department will add nearly 1,000 new police officers over the next two years. Still, it remains unclear how exactly the city will come up with those funds. The speech comes after the police department also unveiled a new draft policy regarding officers' use of force following criticism over the killing of Laquan McDonald, a Chicago teen who was shot by a police officer 16 times. It also follows an earlier speech on violence, where Emanuel called on residents and politicians as he laid out a three-point plan for fighting Chicago's ever-prominent crime problem. Emanuel said he plans to add 2,000 summer jobs for young men in the city’s mentor program and increase after school programs to allow 1,000 more children to participate. He also claimed nearly 60,000 CPS students will receive free eye care and more than 100,000 students will receive free dental care.